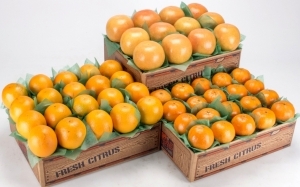 We know it's Spring in Florida when juicy Valencia Oranges, easy-peeling Honey Tangerines and sweet Ruby Red Grapefruit are all ripe and ready to harvest at the same time. Valencias have a classic orange flavor similar to our winter Navels, and they're seedless too! A unique Florida heirloom variety, Honey Tangerines are named for their amazing flavor. And Spring is when the natural sweetness of Indian River Ruby Red Grapefruit is at its peak. You won't know which to savor first!